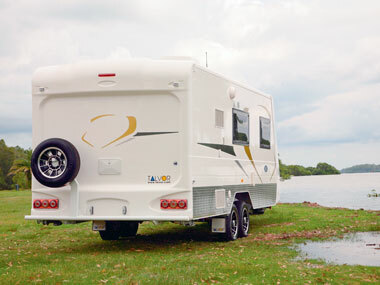 HAVING ORIGINALLY EVOLVED from the very successful Apollo rental operation, motorhome manufacturer Talvor has since evolved again, this time into the world of caravan manufacturing. The first Talvor caravan rolled off the production line in 2011 and I managed to get my hands on one before it disappeared out the sales door. "Our new range has been quite popular," Talvor marketing manager John Melenewycz said. "We have been very happy with the response." Such a positive initial reaction from the market actually says something because moving from the motorhome pond to the larger caravan swimming pool can be quite a challenge. So how does the new Talvor van stack up? My review rig was Talvor's 650A model, which has an external length of 6.5m (21ft 4in). Not surprisingly, the new Talvor caravans bear a certain resemblance to the company's motorhome range, both inside and out. Looks might not be everything, but in a market where one van can easily blur into the next, it's good to stand out from the crowd in some way. And with its nicely moulded back and front walls, the 650A does just that. This rig is built using a marine-grade fibreglass construction with seamless single-piece panels for the walls and roof. Interior and exterior walls are gel-coated and have closed-cell polyurethane foam for insulation. While the tinted hopper-style windows and entry door appear in what could be called a European style, they are actually sourced from China. I did note the front window might benefit from a stone protector. The front boot comes with marine carpet lining and is home to the van's 100Ah battery, plus the charger and electrical controls. Underpinning the 650A's body is a hot-dipped galvanised chassis with 4in main rails and 6in drawbar arms, and the whole thing rides on tandem-axle Al-Ko suspension. 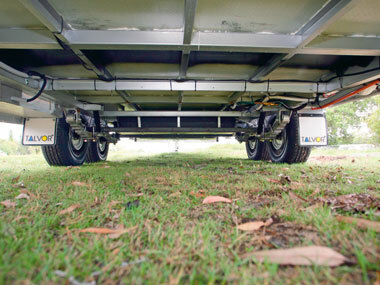 A look underneath reveals a tidy area with water tanks mounted above and forward of the axles. Two 4.5kg gas cylinders sit on the drawbar, along with the ball coupling, jockey wheel and handbrake. Still on the van's construction, I noticed something interesting while watching a test video of the 650A at the Talvor factory: at one point in the video the rear tyre of the tow vehicle blew out and the van flipped over. Although it was clearly damaged at the point of impact, I was very impressed by the fact the van's structure stayed largely intact inside and out. This is a well-made rig that can clearly take a bit of punishment. 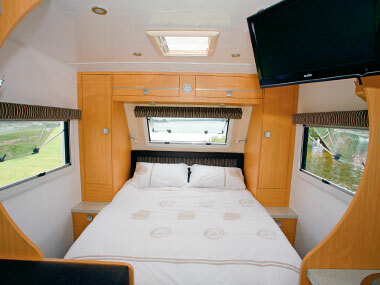 On the inside, Talvor has used the front bedroom, full-width rear bathroom layout, with kitchen and dinette in between. It did seem to me the sizes of the various areas were about right in terms of space and usage. As with the Talvor motorhome range, the interior colour scheme, including a very glossy cabinetry finish, keeps things light and bright. LED lighting has been used throughout, including some very subtle wall fittings. There is also a roof-mounted air-conditioner. 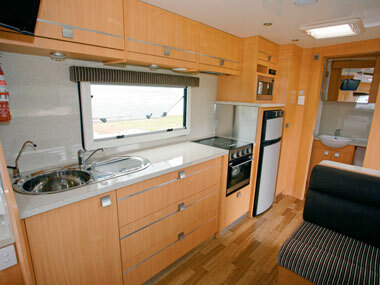 The large kitchen bench fills most of the mid-offside wall and should keep most travelling chefs happy. 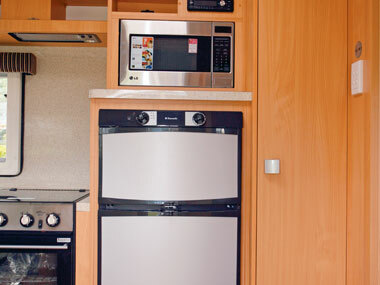 It comes with a three-burner cooktop/oven, stainless steel sink, and 175L Dometic fridge with microwave above, which is set at a very usable height. With all those appliances installed, there is still plenty of overhead locker space, with cupboard and drawers below and a full-height pantry between the fridge and bathroom. I did wonder, however, about the three very large drawers in the kitchen, and the extra weight they might end up carrying. The cafe-style dinette comes with a versatile tri-fold table, though the table sections seem a bit thicker than most I have seen, which did make it a little heavy when lifting. 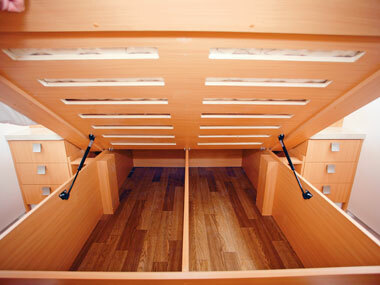 Under-seat storage is easily accessed via floor lockers, and there are overhead lockers and downlights above the seats. 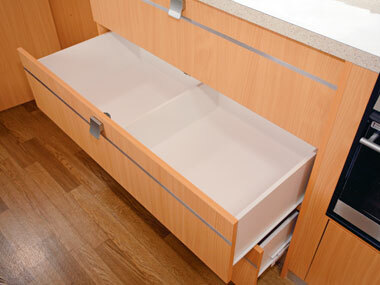 A cabinet behind the rear seat provides additional storage. 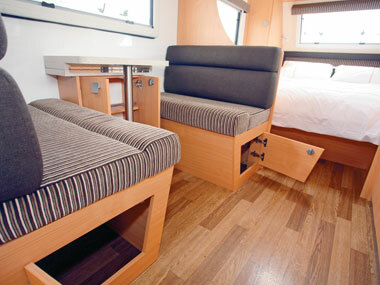 Up front, the queen bed has a slotted timber base over the storage space, along with overhead lockers, side wardrobes and cabinets. There are also upper and lower cupboards in both foot-of-bed corners, but while these are handy for storage, the lower units make it a little awkward to get around the bed. I would think people who aren't so mobile might be happier without them. Rounded partitions separate the bedroom from the rest of the van, and while they look interesting, they do create a small problem with the flatscreen TV mounted on the offside, forcing it to stick out a bit - and me to bump my head on it. 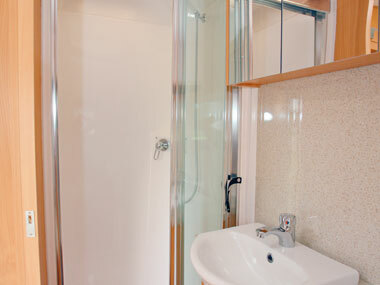 Rear bathrooms in caravans tend to come in various sizes, ranging from too big to too small, but I reckon the 650A's is about right, with the shower cubicle in the offside corner and the Thetford cassette toilet opposite. This design leaves enough space for the washing machine in the rear nearside corner, a vanity in the middle and cupboard space filling much of the rest. Both cupboard doors above the basin are fitted with mirrors. On the road, the 650A behaved very well when under tow. My Nissan Patrol tow vehicle, which came from the Apollo rental fleet and had more than a few kilometres on the clock, handled the 2500kg or so of loaded caravan without a problem. So how did the Talvor 650A stack up? Very well, I have to say. Although built by a company better known for its motorhomes, years of RV design experience shows through in a number of features and, as mentioned above, the Talvor vans are getting plenty of testing. 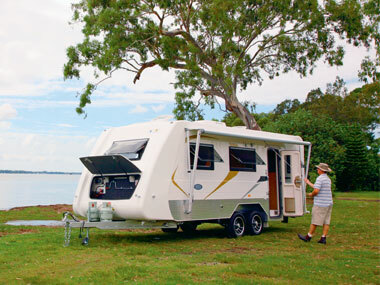 This particular unit, along with the numerous other layouts available, shouldn't have too many problems finding a niche in the Australian RV market. 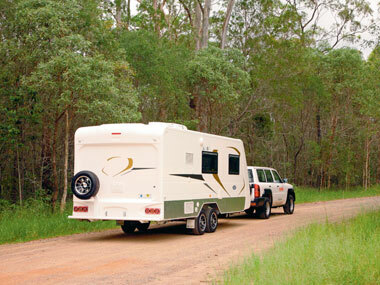 The Talvor 650A is very well-suited to comfortably exploring the highways and byways of this great land. 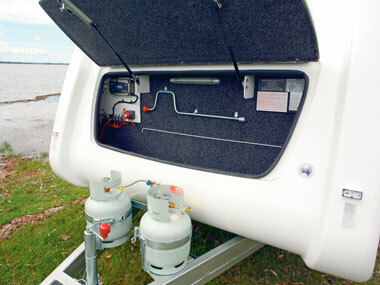 Source: Caravan World Apr 2012.